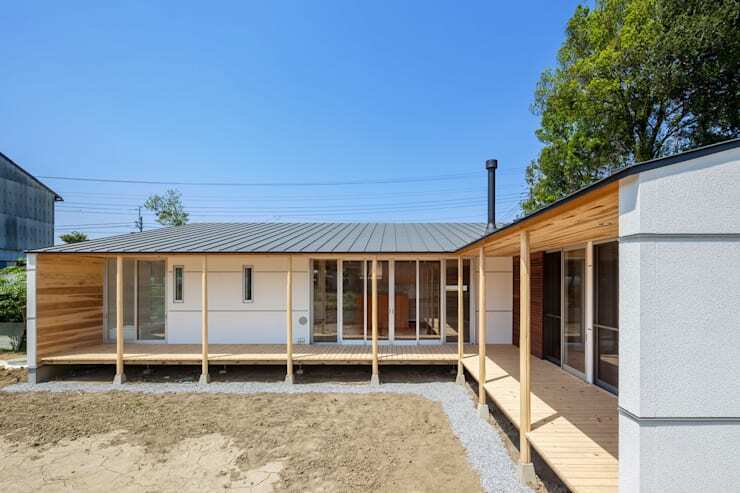 The single-level home has an L-shaped layout with deep eves and a long wraparound veranda. The L-shaped design with its' two wings acts a welcoming embrace and creates a sort of boundary around the outdoor area. It also provides acts as a good wind break so the occupants can enjoy the outdoor area. Finally, the gently sloping roof is designed to make it easy to install solar panels in the future. The rear facade or north-facing side of the home receives the full brunt of the strong winds. Accordingly, the architects have designed it as a wind-break. The windows are small and the side entrance we see to the left is set behind a wooden wind-break. Note the high-set panel windows, they are used to harness the wind to create a fresh cross-current throughout the home when needed. The porch has a wetted perimeter to repel heat and optimise energy consumption. This provides shade from direct sunlight during summer. At the same time, the length of the veranda creates a lot of opportunity to absorb precious sunlight during the winter months. Finally, the depth of the wooden porch also functions as an extended play area for young children. Large floor-to-ceiling sliding doors allow the home to be opened wide for maximum airflow. 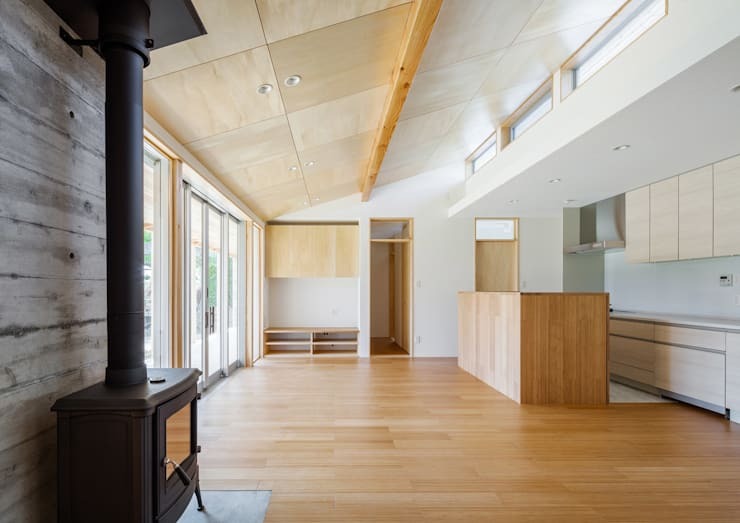 The high-set panel windows on the right can also be used to create a very strong flow of air throughout the home, passively cooling it when needed during summer. They also allow a profuse amount of natural sunlight to enter the home during the mornings and evenings. Finally, note the minimalist white and timber decor. This is commonly seen in contemporary Japanese homes. 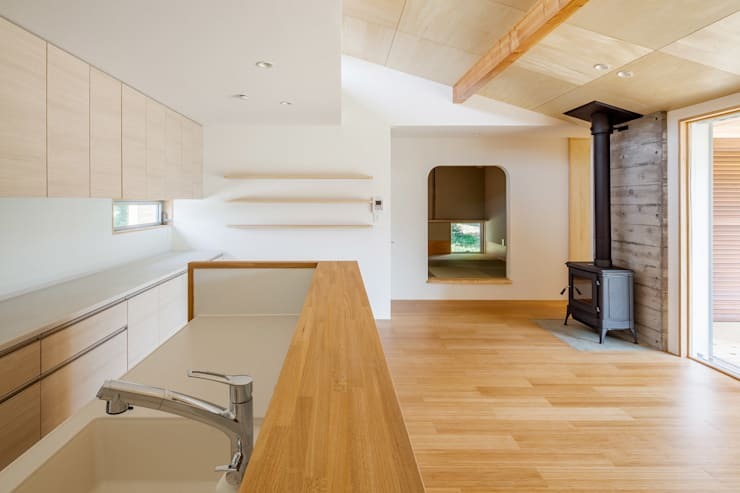 At the far end of the combined living/dining and kitchen, we have a unique step that leads to the Japanese-style room. The curved upper corners of the doorway gives this room a unique look and really separate it from the rest of the bright home. From this angle, we can also see the wall of the kitchen area. It's raised to help separate the kitchen from the living area and shields the kitchen activity from view. 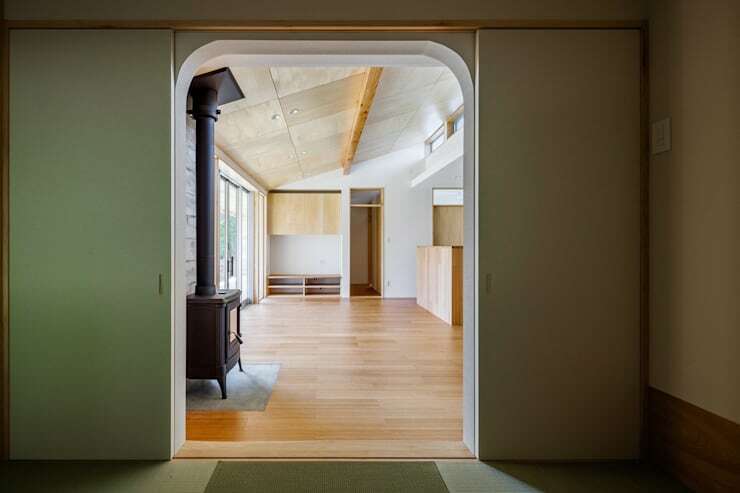 The Japanese-style room, also known as a tatami room, is set apart from the main traffic areas and provides a little, quiet retreat within the home. This is a room that might be used for reading or spending quiet time with close friends or family. Shoes would never be worn in here. 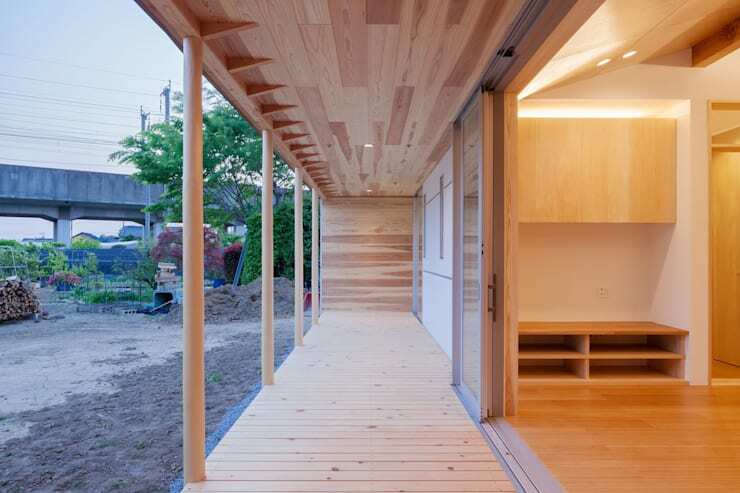 Accordingly, it has sliding wooden doors so it can be completely separated from the activity of the main living area. For more architectural inspiration, check out A one-storey family home in Korea. 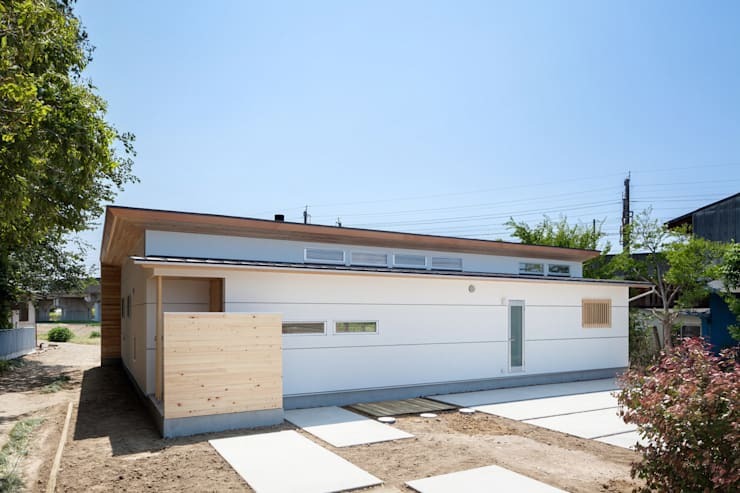 What do you like best about this Japanese home?